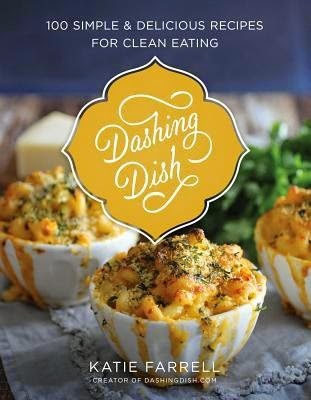 "The Dashing Dish"is an inspirational cookbook chock-full of healthy, innovative yet simple recipes, most of which are gluten-free, sugar-free, and abundant in whole grains. In warm, accessible language and beautiful photographs, Katie shares100 recipes for clean eating. Every recipe is simple to make and delicious to eat. Katie uses gluten-free oat flour in place of wheat flour, cottage cheese and yogurt in place of fat, and Stevia in place of sugar. Her tips are practical, her tone inspirational. Anyone looking to eat better for the rest of their life will want to own this book." Okay, my obsession with cookbooks continues with Dashing Dish which is one dashing book. Yes, I know that was cheesy but I'm one tired mama today. I just spent some time going through this cookbook and I'm still drooling just thinking about all of the amazingly delicious looking recipes in this book. Pictures - this book is filled with delicious pictures of every recipe. Healthy - Since this is a clean eating cookbook, these are healthier versions of our favorites! Layout - Easy to use, easy to read. Waiting - The boys and I are going to start doing 1 week cooking sessions from different cookbooks, but we won't have the time together until Spring Break...and I want to eat all of the foods now! Seriously, if you're looking for healthier alternatives to some seriously delicious recipes, don't hesitate to pick up this book. You won't regret it!